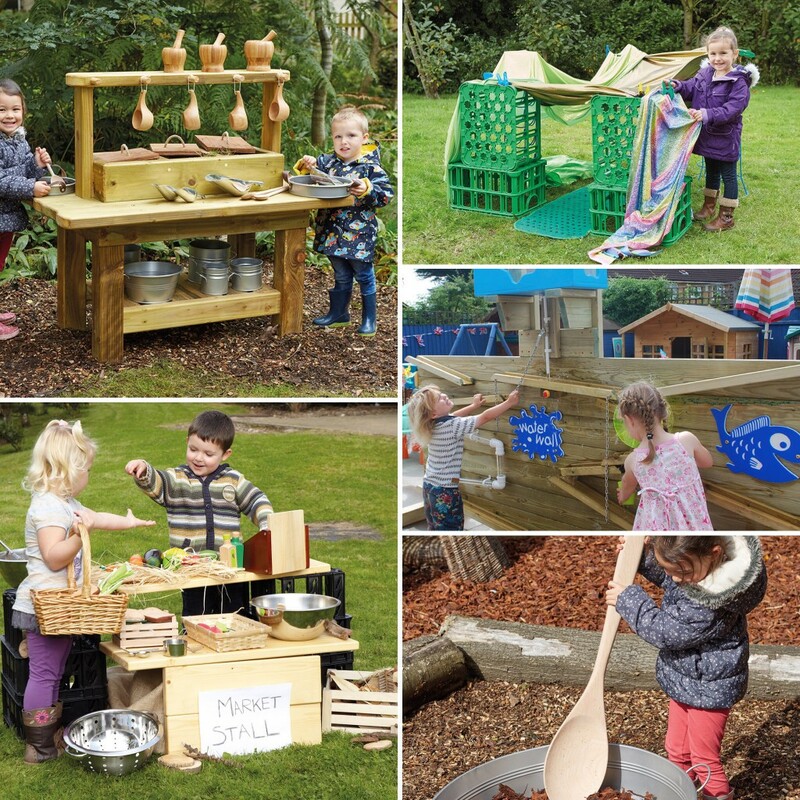 Outdoor play can often be seen as tricky to set up and manage or is just treated like a play time, but when done well outdoor play is the most amazing opportunity for children (and adults) to learn, explore and discover. 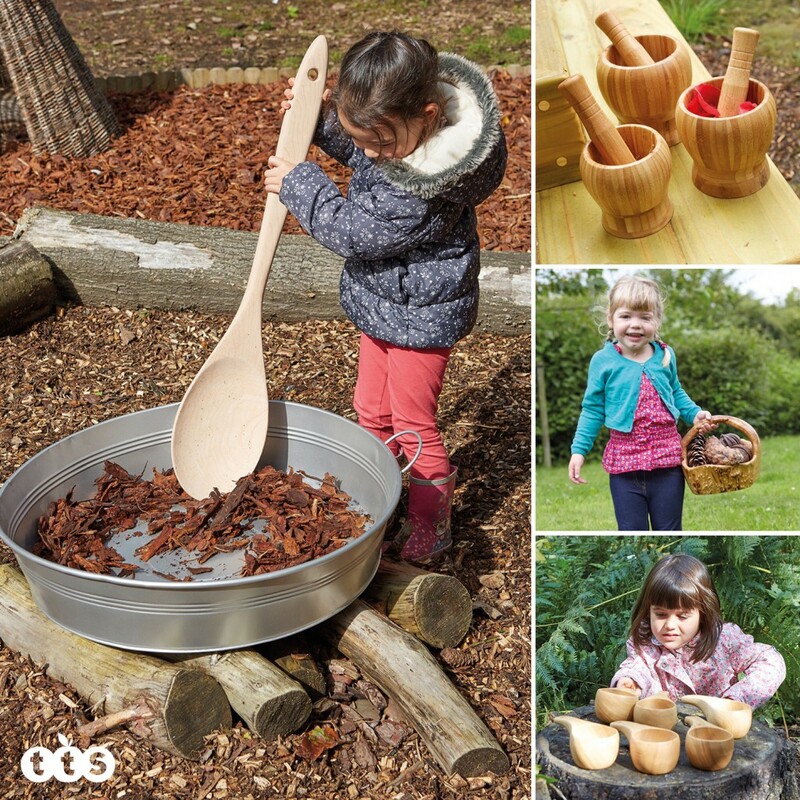 Some of the best resources for effective outdoor play come from nature itself, but as adults we can enhance the nature that is available with resources and experiences that will provoke interest, engagement and learning. 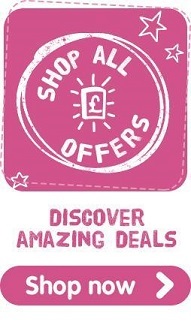 The lovely Early Years Team from TTS asked me if I had £1000 to spend on the outdoors range from their catalogue, what would I buy? I have to say there is lots that takes my fancy! When I am planning an outdoor space these are the things that I would consider as a starting point. 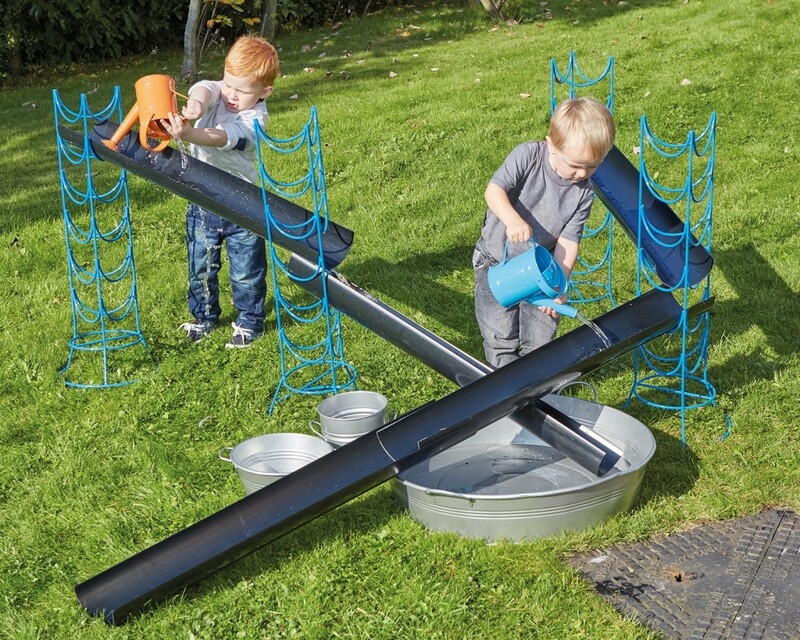 Your outdoor play space should be different from your indoor space. 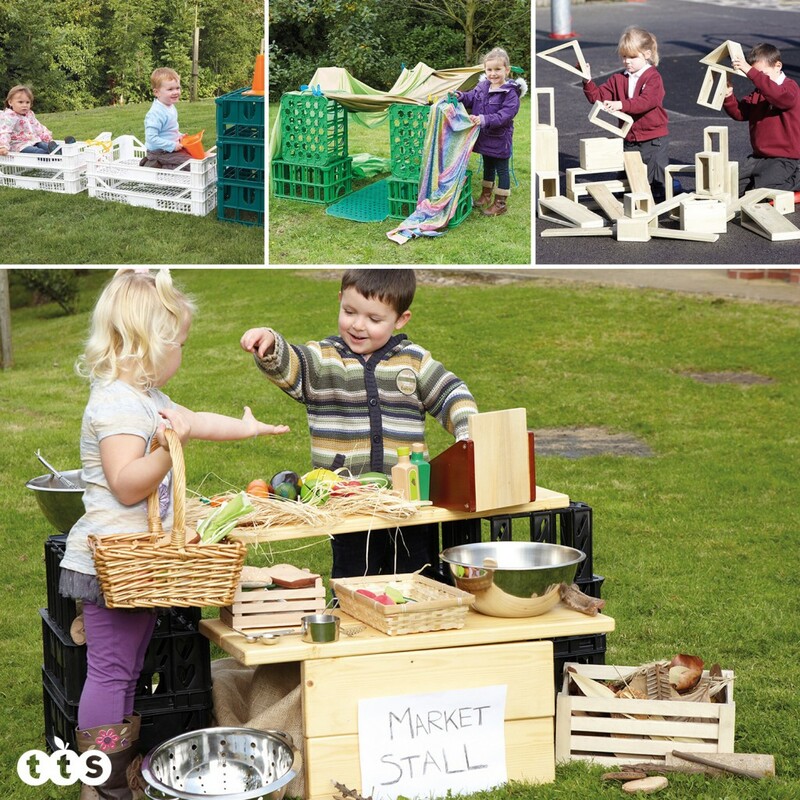 There is a BIG difference between outdoor play and indoor play that has been taken outside. I definitely don’t want my outdoors to look like my indoor space with the roof taken off. 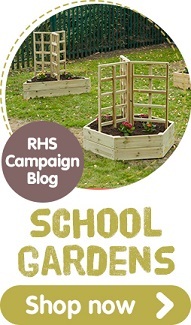 I want it to feel different and to look different so that children can access a whole range of new and diverse skills and learning opportunities. 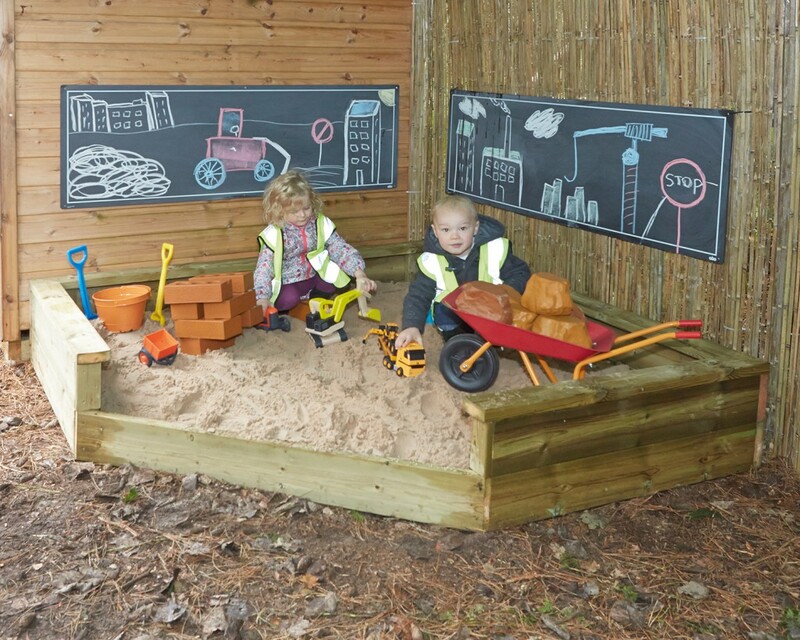 A sand tray that has been pulled outside is not outdoor sand play. It is indoor sand play taken outside. The same goes for water. 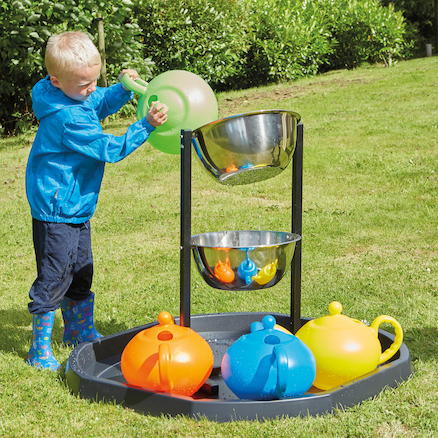 Ideally I would provide the children with some large scale sand and water water play in my outdoor area like a Water Wall, but if you haven’t got the resources or the room, then try and think how you can use or resource your outdoor water tray differently to your indoor one. 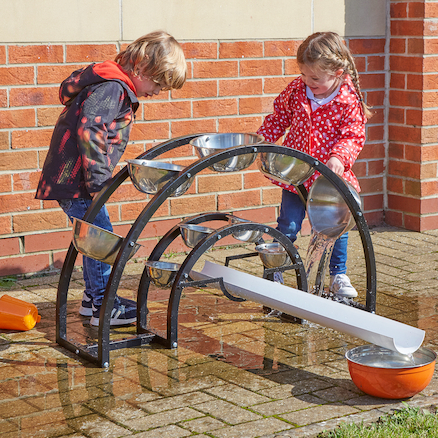 The addition of something simple like some Jumbo Guttering Stands and some Water Channels can help children to apply what they already know about water play in a different way. 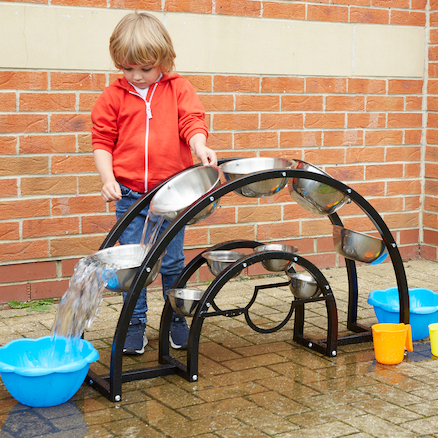 A Cascading Messy Station or a Water Bowl Cascade are great ways for children to explore the properties of water as well as a bit of physics! 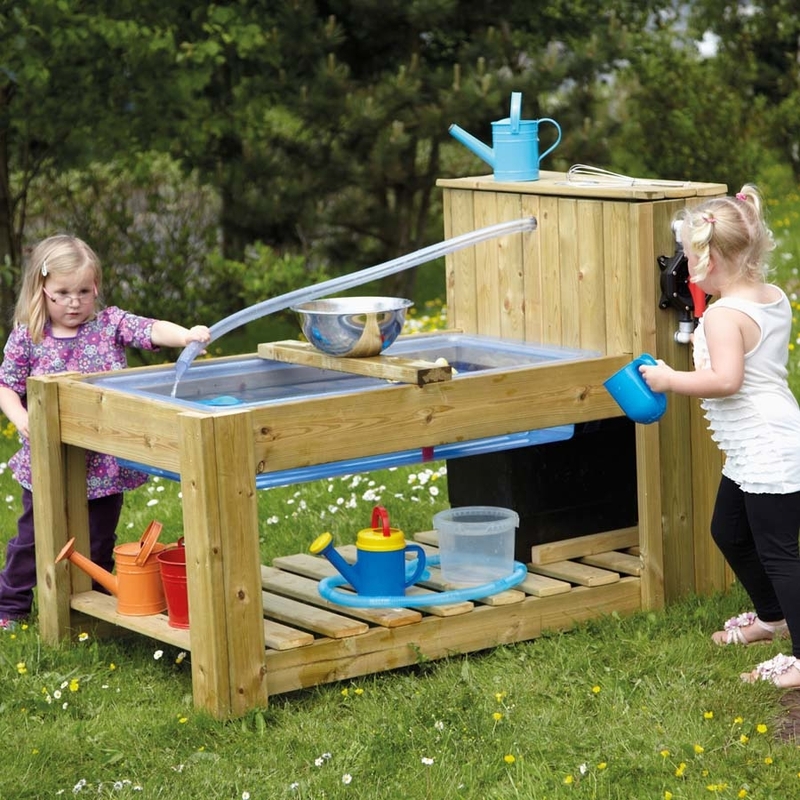 You can’t beat a large outdoor sand pit like this one (Jumbo corner Sandpit) and the addition of the pump makes this Water Pump Station a great starting point for larger scale water exploration. When it comes to sand and water children love to fill, empty and transport! 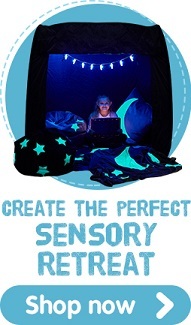 Outdoors gives us lots of space to be able to do this on a larger scale. The cleaner is also less likely to moan about the mess on the carpet! I would try and provide an interesting range of equipment. 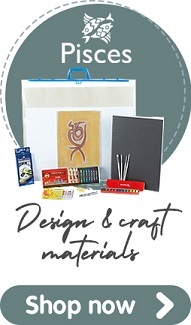 Interesting not only in size and shape, but also in material and texture. 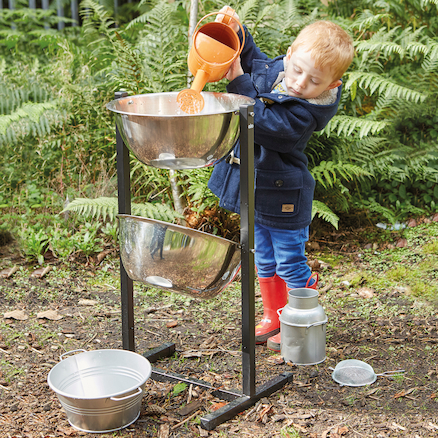 Metal cans, tubs, jugs and pans would be a great start mixed in with some gorgeous wooden pestle and mortors, wooden handled cups and wooden baskets; and just think what your children could do with this Super Large Spoon (other than chase each other round with it)! Lego on a blanket on the grass is not an outdoor construction experience, it is an indoor one taken outside. 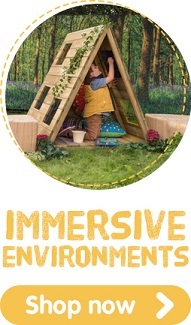 I am not saying that I think indoor experiences should never be seen outside – you might well be encouraging a child to pursue their particular interest with cars or Lego, and support them in carrying this interest into the outdoor environment. But if I was looking at outdoor construction, alongside my logs and sticks I would be thinking about something like these Hollow Blocks which support lots of open ended thinking and experimentation. Other resources like Creative Crates are also great for construction – and other things. 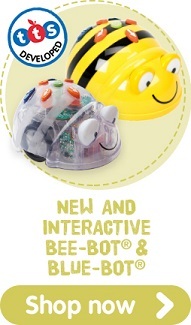 A child’s world should be full of imagination and adventure. 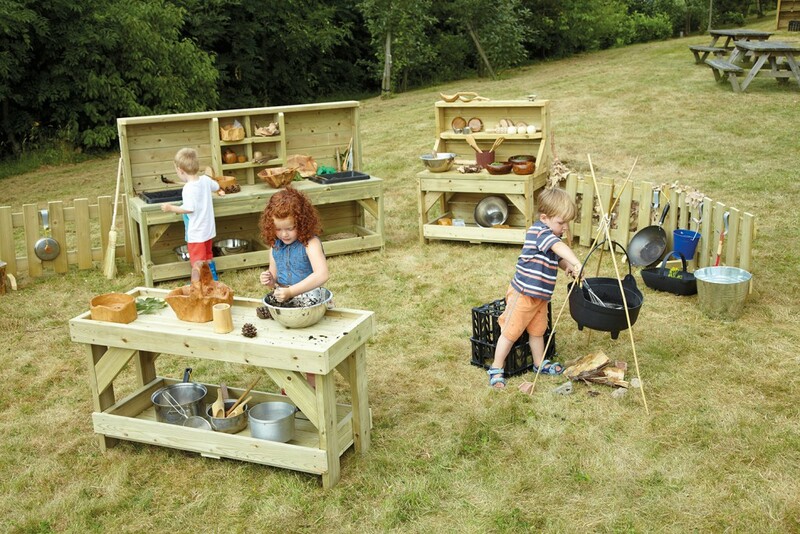 Outdoors is the perfect place for them to explore familiar play situations as well of those of complete fantasy! Don’t forget that a train is always a train and a pirate ship is always a pirate ship. 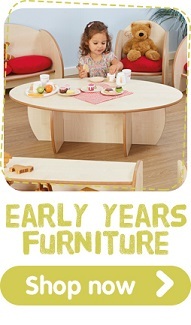 We can enhance a more ambiguous structure with a variety of resources that will support children’s interests and play. It is hard to make a wooden pirate ship into anything else other than … a wooden pirate ship! When I am creating spaces for Small World and Role Play outdoors I try to be as ‘fluid’ as possible. Choose open-ended or ambiguous structures like this Messy Station or Creative Concoctions Dresser. 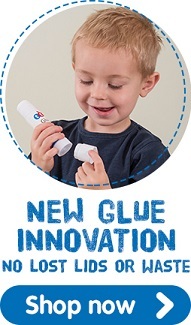 Anything with shelves, a work space and some hidey holes like the Potions and Concoctions Creative Centre is a great start for creative exploration. In an outdoor space you will find that you can create a variety of little pockets of Small World joy! 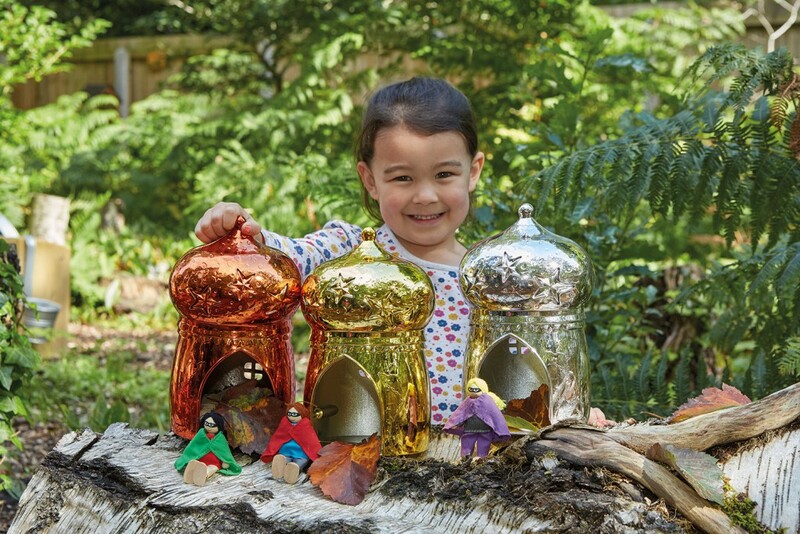 Children will often be happy to play in an imagined world with stick people, fur cone animals and boats made out of leaves, but you can also enhance their play with open ended provocations like this Woodland Village or spark their imagination with something like these Magic Sparkle Cottages! 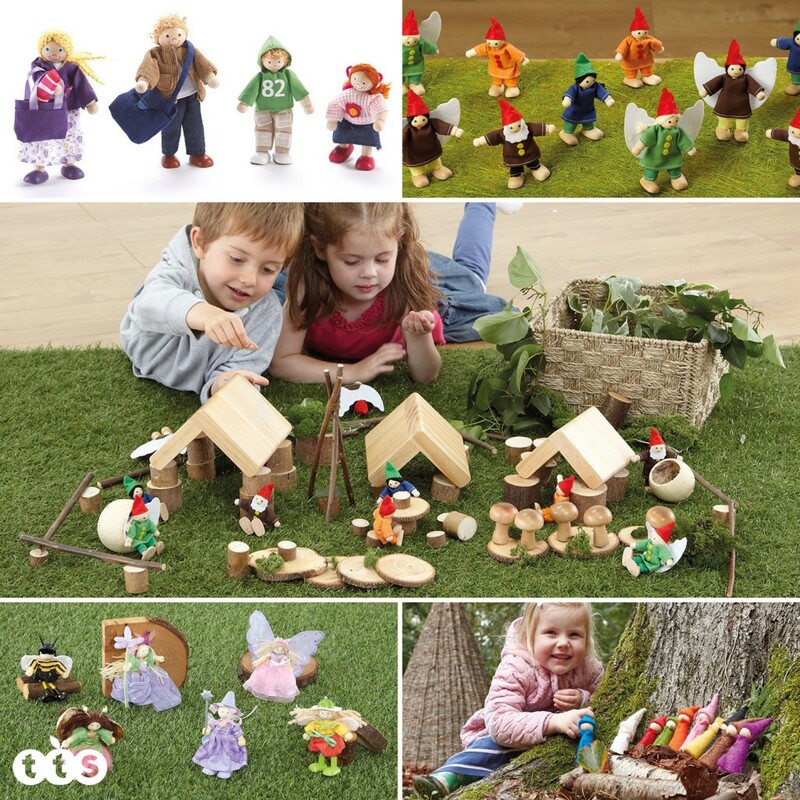 Whether you offer children the opportunity to invent their own real or imagined characters with these ambiguous Wooden Peg People or you give them something more concrete to reflect their interests like these Fairies or Construction Workers, there are plenty to choose from! 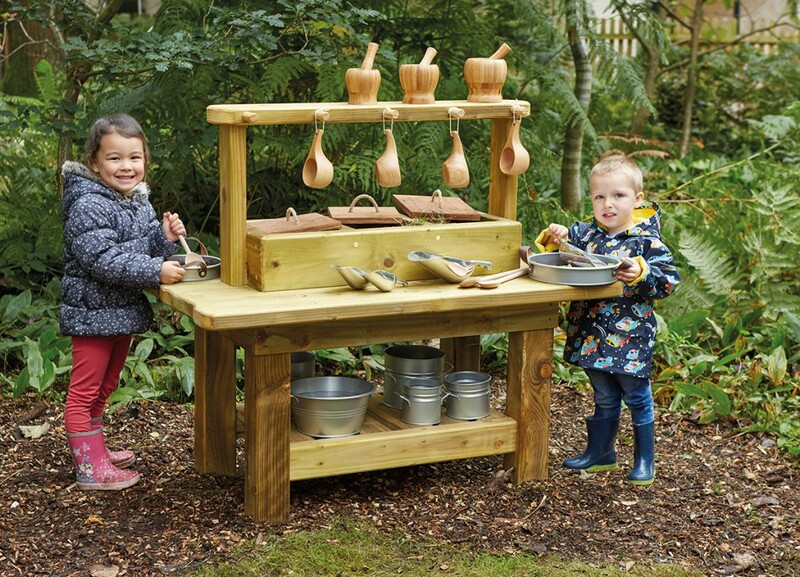 I know that I haven’t covered every aspect of outdoor play, and that if I bought everything that I have mentioned above I might have spent just a smidgen over my £1000 budget!! But, hopefully I have given you a flavor of the sort of resource that I would buy and why. Thanks for the challenge TTS – I found it really hard, not because of the lack of good resources, but because there were so many! 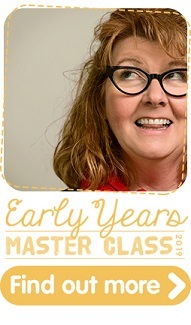 Alistair Bryce-Clegg: Formally Head of a 3 form entry Infant school for 10 years, Alistair is now an award-winning Early Years consultant, blogger (abcdoes.com) and author; he also sits on the advisory board for Early Years Educator and has a range of Early Years products. 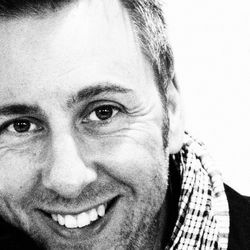 Alongside international work in a range of settings, Alistair also works with Local Authorities across the country.